Depression and anxiety disorders (described collectively as internalizing disorders) are widespread conditions that contribute titanically to global suffering and burden. Despite their prevalence, much is unknown about their etiology, although it is clear that a wide variety of factors—psychological, biological, and environmental—play important roles. The Internalizing Disorder & Emotional Adjustment (IDEA) Lab conducts research that we hope will help elucidate how diverse factors (genetic, interpersonal, environmental, cognitive, etc.) interactively contribute to risk for internalizing disorders, and how internalizing disorders in turn impact psychological functioning and the social environment. We are interested in emotional health across the lifespan, but a prominent component of our research specifically focuses on adolescence, a period when depression risk increases precipitously (corresponding with rapid changes in both biology and the interpersonal environment). 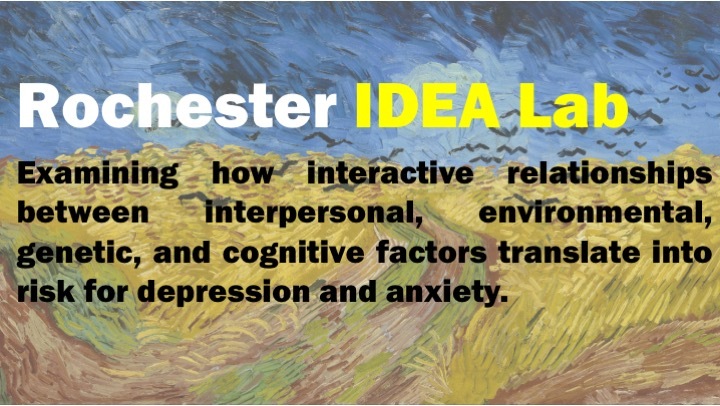 The IDEA Lab is housed in the Department of Clinical and Social Sciences in Psychology at the University of Rochester. Prospective graduate students should check out our clinical psychology Ph.D. program.